The portable Garmin StreetPilot c550 comes with preloaded maps of Europe and includes automatic routing, 2D or 3D map perspective, and turn-by-turn voice directions that speak street names - making navigation easy. It is also an MP3 player and accepts customized points of interest (POIs) such as school zones and speed cameras. Bluetooth® wireless technology with hands-free calling, an integrated traffic receiver, MP3 player, plus much more. Garmin StreetPilot c550 has been discontinued. Accessories, spares and parts are still available for your StreetPilot C550, as are road maps. The Garmin StreetPilot c550 includes an automotive-grade, sunlight-readable, anti-glare display and features autorouting. The Garmin Lock anti-theft feature disables the unit from performing any functions until you type in a specific 4-digit PIN or take the unit to a predetermined location. Features exclusive to the StreetPilot c550 GPS satellite navigation system include Bluetooth technology integrated with a microphone and dual speakers that lets you to make hands-free mobile phone calls on a compatible Bluetooth wireless phone. View incoming calls on your StreetPilot c550, and simply tap the screen to answer. Just speak into the built-in microphone while staying focused on your driving. In addition, retrieve and dial numbers from your personalized phone book or the phone's call history log. You can also make calls from the StreetPilot c550's huge points of interest database - which includes hotels, restaurants, stores, and much more. Another feature unique to the Garmin StreePilot c550 is its integrated traffic capabilities. The Garmin StreetPilot c550 includes, an integrated traffic receiver which notifies you of traffic, construction and weather delays and automatically suggests alternative routes. Optional software available on plug-in SD cards, lets you instantly add new features to your Garmin StreetPilot c550 - without connecting to your computer. Travel GuideT gives you helpful and thorough reviews and recommendations for restaurants, hotels, shopping, nightlife, sporting events and tourist attractions. The new Garmin StreetPilot c550 boasts distinctive and sleek styling - the only buttons are a rotary volume knob and an on/off switch. The device is secured by a suction-mount cradle that fastens to the windshield for easy portability between vehicles. Users can customize their unit's appearance with an array of colored faceplates (sold separately). 12-volt adapter included. The Garmin StreetPilot c550 includes Navteq maps and provides detailed maps of Western Europe. Navteq maps provide high quality, detail rich maps, which in addition to street information include features such as route calculation, Points of Interest, Estimated Time of Arrival, and more. Looking for accessories and spares for the Garmin StreetPilot c550 view them all here. 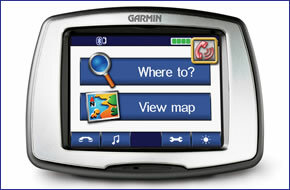 All parts are genuine Garmin product and specifically designed for use with the StreetPilot c550 sat nav. Question: I want to buy the Garmin City Navigator NT Nordics microSD/SD card. Is it compatible with streetpilot c550? Can I avoid the shipping to Canada and be downloaded instead? Answer: The Garmin City Navigator NT Nordics microSD/SD card: is fully compatible with the streetpilot c550. We supply the map on microSD/SD card, this therefore is NOT a download. Do you have a question about the Garmin StreetPilot c550? Submit your question via our contact page.